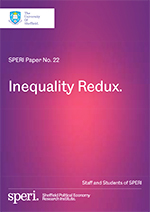 We are delighted to publish as a SPERI Paper the series of blogs by SPERI staff and students, which ran from February to April 2015, all devoted to the theme of inequality. The posts were intended to paint into place a different backdrop to the issues that were being debated in the British General Election campaign which ran as the posts were published. Inequality was very much the dog that did not bark in that campaign. Yet the issues raised remain as relevant as ever. They make a stimulating contribution to the cause of continuing the debate in Britain about the deeply worrying trend in society and political economy towards intensified inequality. Download SPERI Paper No. 22: Inequality Redux.